The students ranged from age two to eleven, and differed widely in their temperaments and abilities, goals and destinies. But they all had one common bond: their genealogical sanctity and mana as Aliʻi-born. The school building was square-shaped, about seventy-six square feet in area, with a courtyard in the center and a well. The thirteen or so rooms included a large classroom, kitchen, dining room, sitting room and parlor, and living quarters for the students and the Cookes. The entire complex was surrounded by a high wall, apparently intended as much to keep people out as to keep them in. Daughter of High Chief George Naʻea and High Chiefess Fanny Kekelaokalani Young and hānai to by her childless maternal aunt, chiefess Grace Kamaʻikuʻi Young Rooke, and her husband, Dr. Thomas CB Rooke. On June 19, 1856, Emma married Alexander Liholiho and became Queen Emma. They had one child Prince Albert. In 1859, King Kamehameha IV and Queen Emma founded Queen’s Hospital. Son of High Chief Mataio Kekūanāoʻa (Royal Governor of Oʻahu, as well as Kuhina Nui (Prime Minister (1863-1864)) and Princess Elizabeth Kīnaʻu (Kuhina Nui (Prime Minister) as Kaʻahumanu II (1832-1839.)) Hānai by his grandmother Queen Kalākua Kaheiheimālie and step-grandfather High Chief Ulumāheihei Hoapili. Lot Kapuāiwa became King Kamehameha V and ruled over Hawaiʻi November 30, 1863 — December 11, 1872. Son of High Chief Charles Kanaʻina and High Chiefess Miriam Auhea Kekāuluohi (Kuhina Nui (Prime Minister) as Kaʻahumanu III (1839-1845.)) He was grandnephew of Kamehameha I and second cousin to King Kamehameha IV and King Kamehameha V. The first elected King of Hawaiʻi; he became King Lunalilo and ruled over Hawaiʻi January 8, 1873 – February 3, 1874. Son of High Chief Caesar Kapaʻakea and his mother High Chiefess Analeʻa Keohokālole. 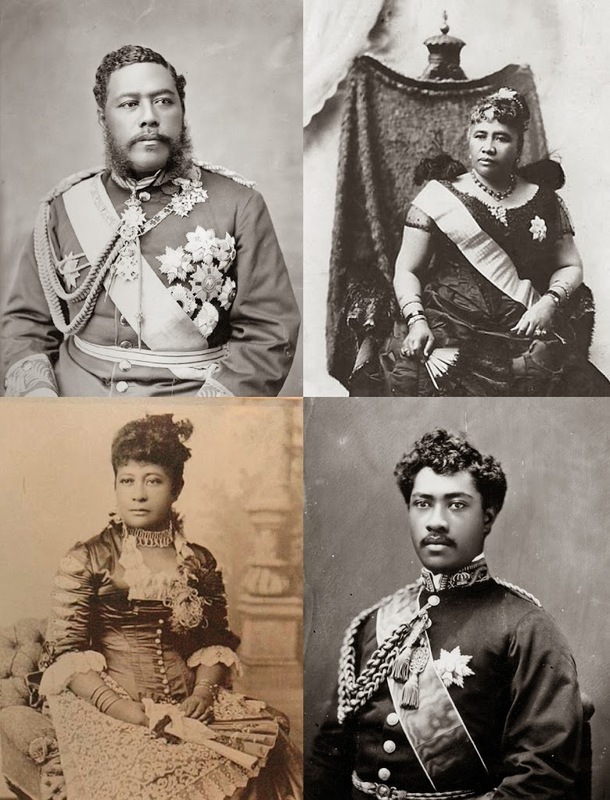 Hānai to Keaweamahi Kinimaka and High Chiefess Haʻaheo Kaniu. 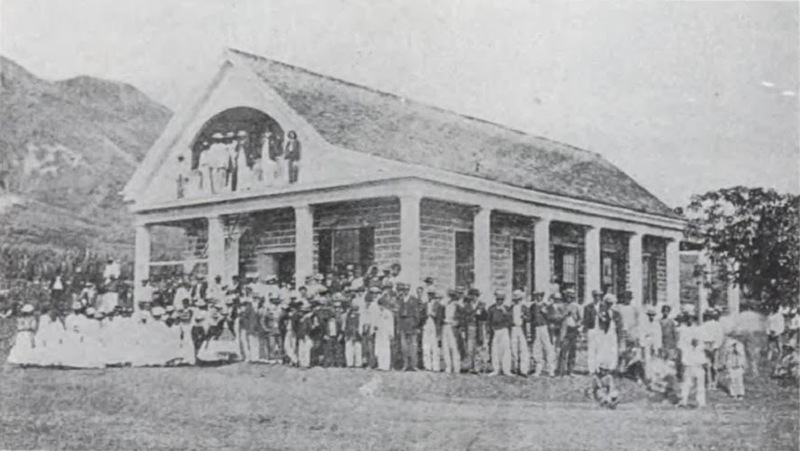 Under Kalākaua’s direction, the cornerstone for ʻIolani Palace was laid on December 31, 1879 (it was completed in 1882.) He earned the nickname “Merrie Monarch.” He defeated Queen Emma in an election to the throne and ruled over Hawaiʻi February 12, 1874 — January 20, 1891. Daughter of High Chief Caesar Kapaʻakea and his mother High Chiefess Analeʻa Keohokālole. Hānai to Abner Pākī and his wife Laura Kōnia. Hawaiʻi’s last reigning monarch, she was named heir apparent (and her name was changed to Liliʻuokalani) and succeeded her brother to the Hawaiian throne and ruled over Hawaiʻi January 29, 1891 – January 17, 1893. Daughter of High Chief Abner Pākī and Laura Kōnia. Pauahi was married to businessman Charles Reed Bishop. Hānai to Princess Kīnaʻu (Kuhina Nui (Prime Minister) as Kaʻahumanu II (1832-1839.)) Great-granddaughter of King Kamehameha I, her estate operates the Kamehameha Schools (established in 1887) according to Pauahi’s will. Daughter of High Chief Gideon Peleioholani Laʻanui and High Chiefess Theresa Owana Kaheiheimalie Rives; she was great grandniece of Kamehameha I. She married Franklin Seaver Pratt on April 27, 1864. She was the last Royal School alumnus to die. Son of Mataio Kekūanāoʻa and Elizabeth Kīnaʻu. He was a grandson of Kamehameha I. Son of the Kalanimōku (Prime Minister) and Kiliwehi (daughter of King Kamehameha I.) Hānai to John Adams Kuakini (Governor of Hawaiʻi Island and brother of Queen Kaʻahumanu.) Entering the school in 1844, he was the last boy to enter the school. He was married to the Princess Nāhiʻenaʻena and later to Princess Ruth Keʻelikōlani. Daughter of Henry Coleman Lewis and High Chiefess Fanny Kekelaokalani (daughter of John Young, the advisor of Kamehameha I, and was also grandniece of Kamehameha I.) Entering the school in 1843, she was the last girl to enter the school. In the classroom students were divided by their age and or length of time as the school. The older group consisted of Moses, Lot, Alexander, William, Jane, Bernice, Abigail and Elizabeth who had attended the school since 1839. The next class consisted of Emma, James, Peter and David. Mary was in the youngest class together with Victoria, Lydia, and John Pitt due to her late attendance. The image shows the Chiefs’ Children’s School (around 1848.) In addition, I have added other images in a folder of like name in the Photos section on my Facebook and Google+ pages.